Hale still denied that he had had more than one drink of alcohol the day of the crash, when he was supposed of Marines during a night out at Hennessey’s Tavern. He claimed his elevated blood alcohol level – which was found after the crash to be more than twice the legal driving limit – may have been the result of binge drinking the night before. Arguing that Hale’s drinking was an attempt to self-medicate in order to cope with post-traumatic stress disorder from his experiences in heavy combat in Sangin, Afghanistan, attorney William Paparian asked the judge to allow Hale to receive a shorter jail sentence followed by two years of alcohol-addiction treatment at a local facility. Paparian cited a state law that asks courts to consider whether the offense was committed as a result of trauma or injury from service in the military. Flynn-Peister was unconvinced. While she noted that it was a “tragic case,” the judge said Hale had taken advantage of a position of trust due to his rank among the Marines, and noted that because of his blood alcohol content, Hale must have been drinking the day of the crash. “The court does not find his story plausible or believable,” the judge said. A half-dozen family members of the three Marines who died in the crash submitted victim impact statements that were read in court prior to Hale’s sentencing. Several asked for Hale to receive the maximum sentence, while most claimed that he had never apologized or taken responsibility for the crash. A 25-year-old Marine stationed at Camp Pendleton was charged Wednesday with drunk driving in an Orange County crash that left three fellow Marines dead. 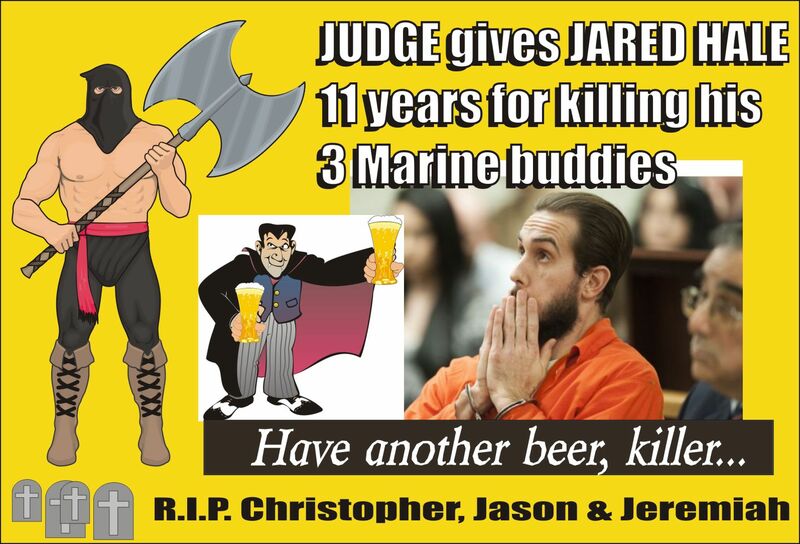 Jared Ray Hale, 25, faces three felony counts of vehicular manslaughter while intoxicated, with sentencing enhancement allegations for having a blood alcohol level of more than 0.15% and causing great bodily injury. In the early morning hours of Feb. 14, prosecutors say, Hale drove away from a Dana Point bar with three friends in his Dodge Stratus. 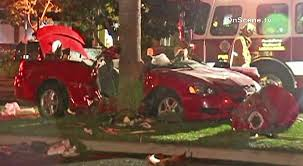 According to officials, the car was traveling at high speeds on Golden Lantern Drive near Terra Vista in Dana Point about 2 a.m., when Hale lost control of the car, which climbed the center median and wrapped itself around a tree. Two Marines, 23-year-old Jeremiah Callahan of Nebraska and 21-year-old Christopher Arzola of Massachusetts, were pronounced dead at the scene. Pirate Trials Hung by the Neck Until Dead. Available in paperback, eBook and audio book. click to hear free 5 min. sample. This entry was posted in America's Best Judge, America's top prosecutors, DWI arrest photos, DWI Arrests by State, DWI crash photos, Hell-hole bars, Impaired driving disasters in history, injury or death, Military Officers charged with impaired driving and tagged Aggravated Driving Under Influence Liquor, Austin Chleborad, blood alchohol content, California Highway Patrol, Christopher Arzola, Driving Under the Influence, driving while intoxicated, drunk driving, drunk driving fatal crash, DUI, DWI, failed his fellow Marines in epic proportions, Hennessey's Tavern, Jared Ray Hale, Jason Chleborad, Jeremiah Callahan, Judge Flynn-Peister, Judge Terri K. Flynn-Peister, OWI, position of trust due to his rank among the Marines, post-traumatic stress disorder, service in the military, three Marines killed in DUI crash into tree, trauma or injury from service, William Paparian. Bookmark the permalink.